When it comes to character meal experiences, Disney has plenty to offer. Some of these experiences are in the parks, offering an escape from the crowds and the heat. Others are available in the hotels, perfect for starting your day, finishing your day, taking a break between park hopping, or as part of a non-park “break” day. Whatever your preference, the character meals can offer a great way to meet characters with no lines while enjoying good food. One of the latest additions to the character meal experience is the Bon Voyage Breakfast at Trattoria al Forno located in Disney’s Boardwalk Hotel. This offering brings a third character dining option to the EPCOT area resorts (Cape May Cafe and Garden Grove) and the first at the Boardwalk Resort. There are several aspects of this meal that are a bit unique. First, the characters are only present for breakfast. There are other character meals like this, but not many. The rest of the day the restaurant is a lovely Italian restaurant, just without the characters. Another unique aspect of this experience is the characters themselves. Currently, it is the only sure way to meet Flynn Rider and Prince Eric. Ariel makes an appearance as well, whom you may meet at Cinderella’s Royal Table or Royal Akershus Banquet Hall. 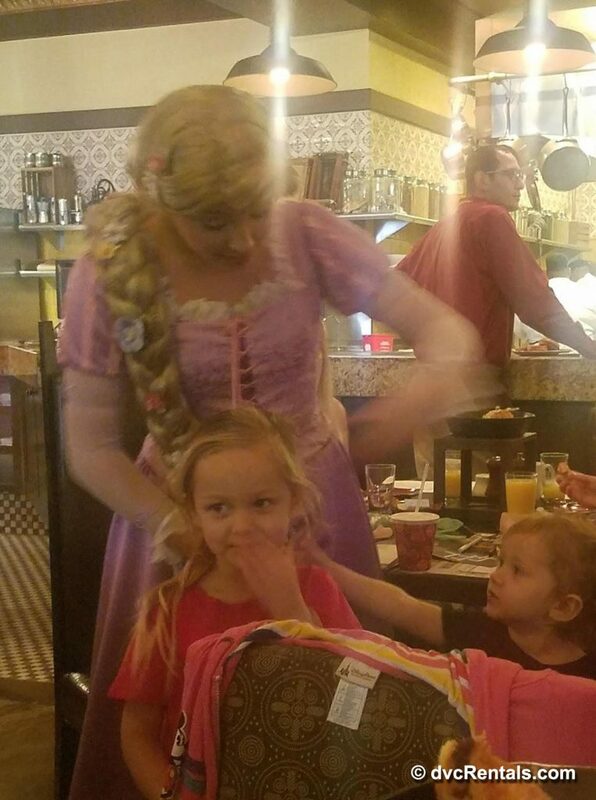 Rapunzel on the other hand I have never seen at a character meal. 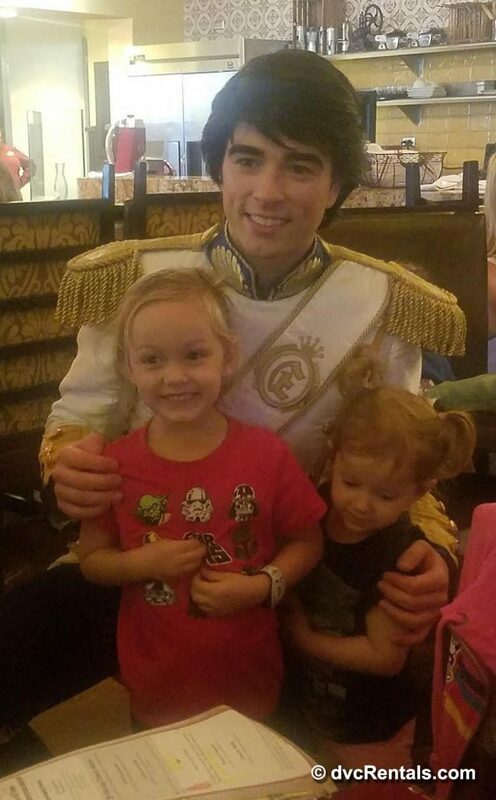 This also makes it a unique character experience in that they are all “human” characters present (only the two princess meals previously mentioned offer this as well). The restaurant itself is very nice. 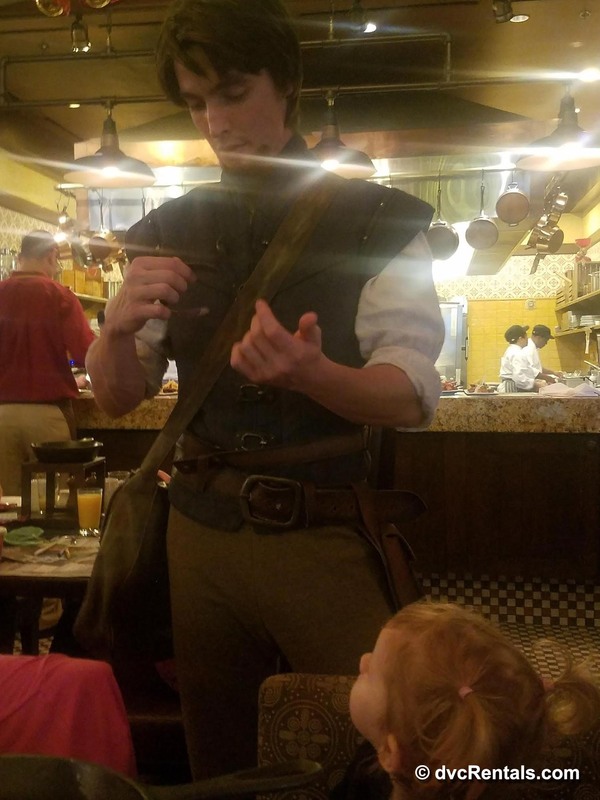 It is perhaps not the most character themed restaurant, however it is kid friendly (there was a vendor cart inside selling toys, autograph books, glow sticks, etc). The kitchen is in the seating area, so you can see the preparations happening (also entertaining to the kids). Each character is announced as they enter the room to applause. For us, the character experience portion took ~35 minutes. Each one came to your table and remained “in character” throughout. They were very good with the kids, posing for plenty of photos and autographs. Once all 4 characters were in the room, they hosted a musical parade (ours was led by Ariel, but that may vary). The food itself was a nice change compared to many of the character dining options. There was a platter of pastries served “family style” to start, and everyone received a cup of fruit salad. However, unlike most other character meals, everyone ordered their entree individually. No buffet, no family style eggs and waffles. Just order for yourself. For the kids, there were options ranging from simple (scrambled eggs) to more interesting (egg white and ham omelet sandwich). The adults had a lot of good options as well. We ordered the pancake tower and an egg Stromboli. Everyone enjoyed the food, and it came out quickly. The characters remained in the room for the duration of the meal. Even when we needed to get up to use the restroom, Flynn and Rapunzel were in the lobby doorway saying hello. It was a nice touch! Overall, we had a great time. When the meal was over, we walked out to the Boardwalk, which is a great area to be in. Surrey rentals, arcade, ice cream, candy shop, easy walk to EPCOT, longer (but still doable) walk to Hollywood Studios, or the boats to those destinations (and other hotels). I would definitely recommend this restaurant for the unique characters, choice of food, and the location. Hard to go wrong! Have you tried the Bon Voyage Breakfast? What did you think? Guest Blogger Robin C is a lifelong fan of Disney. This past Fall was his 12th visit to Disney World and he has stayed in many different hotels. 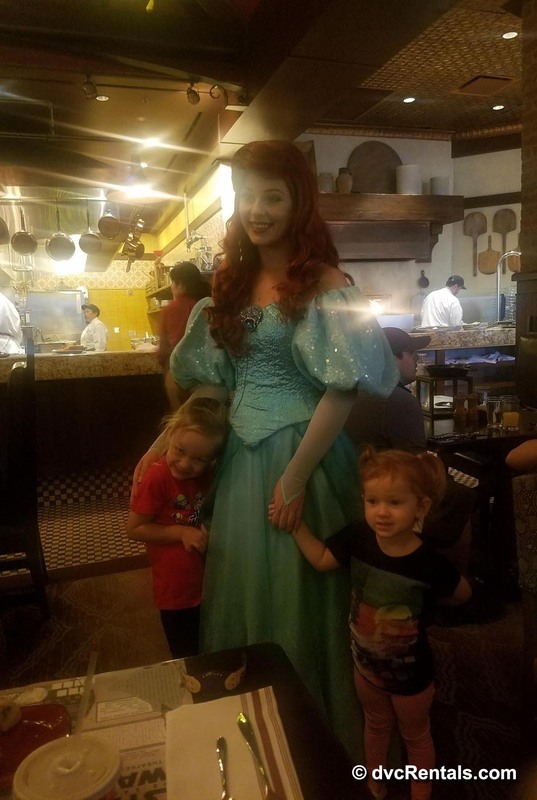 Robin and family always visit different character meals on every trip! 22 thoughts on "Have You Tried the Latest Character Breakfast?" We did this one last week and my girls and I loved it! The food was great & I really enjoyed having a mimosa with the new dining plan! My girls also had specialty drinks (frappe & light-up punch). We will definitely be doing this one again! Soooooo excited to add this to our list of new experiences!! Kali Kleckner I have to send you a pic if I can find. On the dvc board, someone has a frying pan signed with a silver sharpie. It’s amazing!!! Ohhhh I have a small one! I never thought of that! Carol Pondy this is the other one!! This place was very good breakfast. Plan to go back. Plus was so excited to finally meet Flynn. This format, ordering off menu, is the same as the character breakfast on our last DCL trip on the Wonder. That was the only character breakfast we’ve done on the cruises, so not sure if they all follow this, as well. David’s Disney Vacation Club Rentals DVC Rentals -I know. Thanks! I was specifically comparing this one to the cruise.